that reflects the spoken word in all its details...."
Many of the sensorial exercises, by their very nature, are a remote preparation for academic learning. For example, the child who has learned to listen carefully will be able to perceive subtle differences in the sounds of the letters. Of equal importance to language, skills are the geometric materials, which help the child to concentrate on different shapes. For a child to try to acquire both aspects of this skill at the same time is often discouraging and frustrating. It is extremely difficult for him to try to learn the path for making the letters at the same time that he is trying to learn hoe to move the pencil with control. The materials which Dr. Montessori designed offer the child the opportunity to learn the shapes and sounds of the letters in a way that is completely independent from his perfection of the motor skill. The child, therefore, in the Montessori classroom learns to write not by writing, but by performing a number of purposefully structured activities which prepare him both indirectly and directly for facility in handwriting. The child meets the alphabetical symbols by using the Sandpaper Letters. Each letter of the alphabet is outlined in sandpaper on an individual card, the vowels on blue and consonants on red. The teacher shows the child how to trace the letters with two fingers following the same direction in which the symbol is normally written. Use of this material gives the child a three-fold impression-he sees the shape, he feels the shape, and he hears the sound of the letter which the teacher repeats when introducing it. The fact that the letter is made of sandpaper, rather than ink, invites the child to trace the shape. This is an important step in learning to write. The repetition of this exercise fixes the path of each of the letters in the child’s muscular memory. 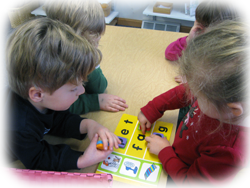 In a Montessori classroom, the child learns the phonetic sounds of the letters before he learns the alphabetical names in sequence. The phonetic sounds are given first because these are the sounds he hears in words. The child first becomes aware of these phonetic sounds when the teacher introduces the consonants with the Sandpaper Letters. The child in a Montessori classroom learns to control a pencil by filling in outlines—an activity which does not weary her because she enjoys it. To make the outline, she uses equipment known as the Metal Insets. Each inset represents a different geometric shape. After selecting a figure and tracing it on paper, the child fills in the outline with a colored pencil of her own choosing. At first her strokes are erratic and often extend beyond the outline. By degrees they become more accurate and uniform. Progress in muscular control can be noted by comparing the child’s designs from week to week and from month to month. Eventually she makes more intricate designs by superimposing two or three other shapes on the original figure. When colored, this effort resembles a stained glass window. Crayons and paint are not used for this activity because the purpose is always pencil controlled. When writing begins in this spontaneous way, the child is spared many tedious hours of forced effort. Writing is fun. Because he has already learned control, the repetition is necessary for developing neatness and style doesn’t tire him. After the child has learned the Sandpaper Letters, she is ready to make words with the large Movable Alphabet. For this activity the teacher prepares a bag of toys representing three letter words with the short vowel sound, such as a bed, a lid, a fan, and a cup. First the child selects an object, such as the bed, and says the name of it very slowly so she can hear each sound - - b . . e . . d. She then selects the letter to represent the first sound and places it beside the object on a mat. Then she selects the letter for the second sound and finally the third. The child often refers to such word construction as writing. The fact that she is manipulating material at this stage is important because she still concentrates best on something she is doing with her hands. The child usually continues the word-building process for a long period of time. The classroom offers a wide variety of small toy-like figures and pictures for which she can build the names. Gradually the difficulty of the nouns increases from three letter words like pig, to four letter words containing a consonant blend, such as flag. Reading very naturally follows the word-building exercises and	implies the understanding of words which someone else has constructed. The opportunity to take this step comes when he matches a set of objects with a set of cards on which the names of the objects are already printed. To place the correct card beside each object he must read the word on the card. Later he matches pictures and words—still using his hands while making visual perceptions. Verbs are introduced to the children by a set of red cards with a single action word printed on each one. The children enjoy these because, as they read each Command Card, they must perform the appropriate action. Words such as run, hop, skip, clap, and wave appear in the beginning set. Later the children follow directions which tell them to “Set the map on the desk” or “Sit on the red mat.” The teacher increases the difficulty of the commands according to the progress of the children. Two different colored Moveable Alphabets are used for building words containing phonograms. A phonogram is a special combination of two or more letters which produces a single sound different from the regular sequence of sounds of these letters. Examples of phonograms are oy in toy, ch as in chin, and tion in action. The particular phonogram which the child is learning is constructed in a color different from the rest of the word. Gradually the child learns the irregular words, and words with two or three syllables, by doing many reading exercises which offer variety rather than monotonous repetition. Also available in the Montessori classroom are many attractive books using a large number of phonetic words. Proceeding at his own pace, each child is encouraged to read about things which interest him. His skill in phonics gives him the means of attacking almost any new word, so that he is not limited to a specific number of words which he has been trained to recognize by sight. Some children read at four, some at five, and some at six. The actual age is not as important as the right moment of readiness. The freedom of the Montessori classroom allows each child’s own interest to determine his progress. The child’s interest in reading is never stifled by monotony. Rather, it is cultivated as the most important key to future learning.